You can import image files (.bmp, .png, .jpg, and .tiff files) to attach to a patient's record. Under Imaging Procedures, select the procedure that you want to perform (each corresponds to a particular acquisition type: individual intraoral X-ray, intraoral X-ray series, extraoral X-ray, intraoral photo, or extraoral photo). 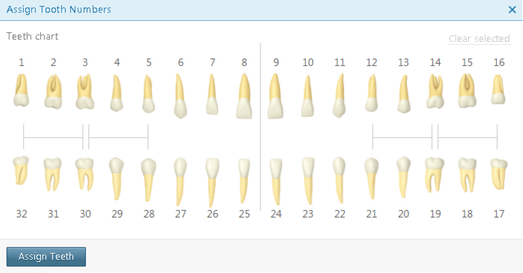 If you are importing images for an individual intraoral X-ray, on the Tooth chart, select the teeth that apply to the current importing session; otherwise, skip this step. On the Acquire Images tab, select the Import From File device in the Available Devices button pop-up list if it is not already selected. Click (or tap) the Import Images tab. Existing Procedure - Use this for a procedure that was performed prior to today (and may already have been billed to the patient's insurance carrier). Specify the date that the procedure was performed. Note: With this option selected, the Apply charges and Bill to insurance check boxes under Billing Options become unavailable because the procedure will be posted with a zero dollar fee and will not be billed to insurance. Completed Procedure - Use this for a procedure that you are performing. Today's date and time will be associated with the procedure. Click (or tap) Proceed with Acquisition. 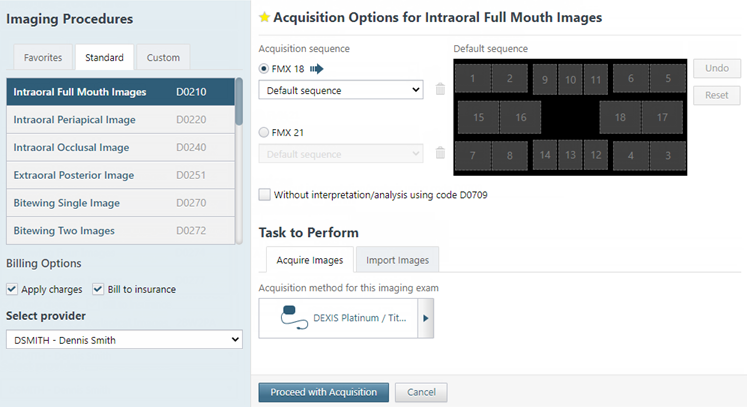 If you are importing an individual intraoral or extraoral X-ray image, click (or tap) Start Acquistion. 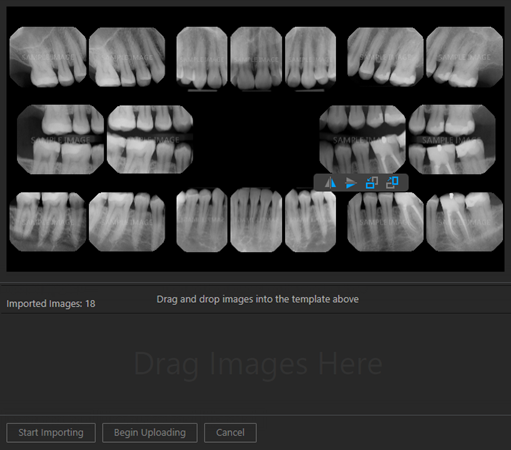 If you are importing images for an intraoral X-ray series, click (or tap) Start Importing. 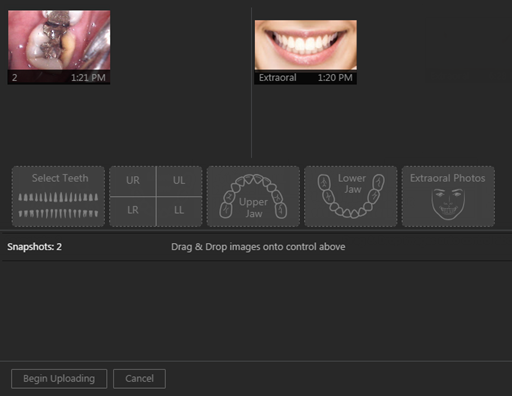 If you are importing images for intraoral/extraoral photos, click (or tap) Start Importing. 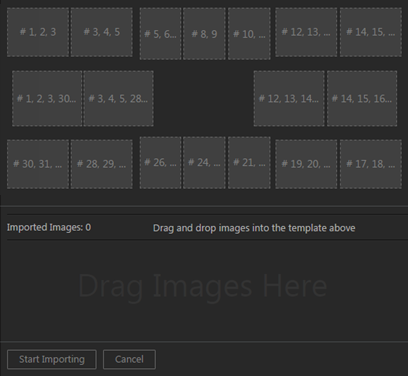 The Import File dialog box appears. Select the desired image files, and then click (or tap) Open. 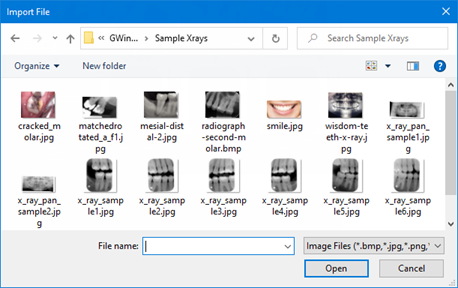 If you are importing images for an intraoral X-ray series or intraoral/extraoral photos, the selected image files appear as thumbnail images on the panel at the bottom of the Dentrix Ascend Imaging program. For an intraoral X-ray series or intraoral/extraoral photos, repeat steps 10 - 11 as needed to import additional images. 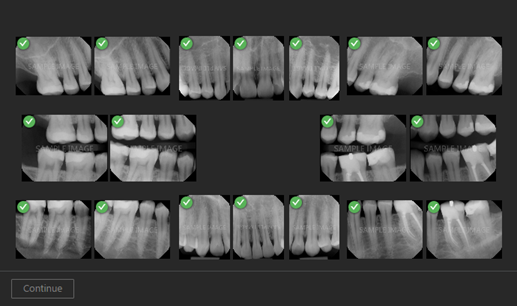 For X-ray images, from the Automatically Apply Enhancement list, select the type of enhancement that you want to have applied automatically to the images (Entire Image, For Perio, For Endo), or select Not Enhanced to not apply any enhancement. Note: When viewing an image after it has been imported, you can turn the enhancement off and on. The original, raw image is preserved. For more information about enhancements and turning them on and off, see the "Processing images" section. 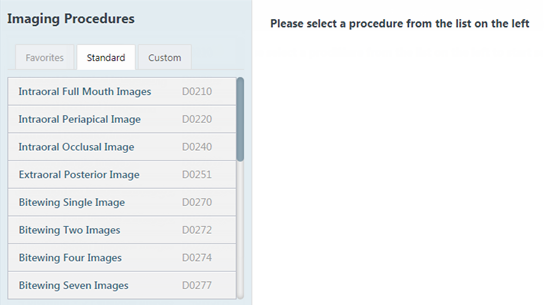 Clear the check box of any thumbnail image on the panel that you do not want to save to the patient's record. Click (or tap) Finish Acquisition (only for an individual intraoral/extraoral X-ray image) or Begin Uploading (only for an intraoral X-ray series or intraoral/extraoral photos). 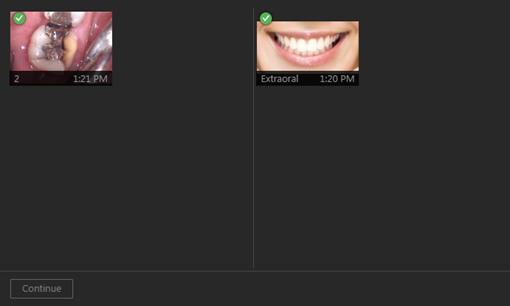 Note: For an intraoral X-ray series, if not all thumbnail images have been mounted into the template when you click (or tap) Begin Uploading, a confirmation message appears. If you choose to continue, only the mounted images will be saved. For an intraoral X-ray series or intraoral/extraoral photos, when the images are finished being saved to the patient's record, click (or tap) Continue. 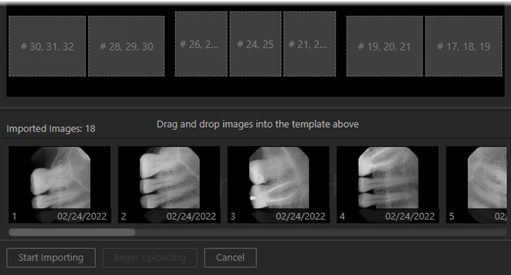 For a set of intraoral photos (or an individual intraoral photo or X-ray), you can assign tooth numbers to a selected snapshot by clicking the Edit button .